This month is simple to report on. Economically painful, but otherwise, enjoyable and almost non-existent. I barely played this month. I’m reasonably sure it’s the lightest month since I started playing online poker in September 2004. That said, I played and lost two of the big weekly ones, paying full freight in both. I played in a few qualifiers (not the really cheap ones either) and didn’t win any seats, so that cost me too. Bottom line was an ugly -$617.00 for the month. Over 2/3 of that came from just the two big tourney losses ($215 each) and with qualifiers, closer to 80%. I had two reasonable cashes (percentage-wise), but they didn’t come close to making up for it. In one, I put in $11 and finished 8th, and collected $39.60. In another, I put up $55 and came 9th (out of 199) and collected $170. The one very bright spot for the month is that since I played very infrequently, I didn’t even get remotely upset (I swear!) even when my luck was horrible. I simply enjoyed playing, and took the beats in stride better than in the past, even though I have been improving in this area for a while now. Anyway, I’m reporting now because I know for sure I won’t be playing tonight, so this is officially the end of the month for me. 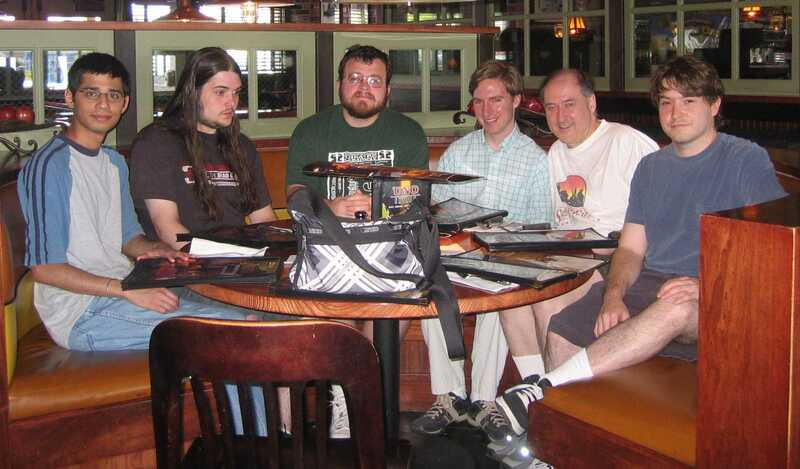 We’ve been coming to Fredericksburg, VA consistently for 11 years, since we first approached the Digital Creations team (now called Zope Corporation) about a possible investment. Since July 2001, the number (and length) of visits increased dramatically and has remained steady. That’s because since then, we have both been involved more in the operational details of Zope Corporation than we had been previously. Tuesday evening, four of us walked along the Fredericksburg Canal (after work). It was a slightly more leisurely pace than I normally walk at back in NY, but it was beautiful and the company was excellent. We walked for just under an hour, and the four of us grabbed dinner at Tropical Smoothie Cafe. So, after work, we met at the base of Lee Hill. It’s a reasonably steep uphill climb of roughly 1/4 of a mile. At the top are two canons, a few placards, and not much else. We came down a few minutes later. We drove to the next parking spot (perhaps another 1/4 of a mile up Lee Drive). We entered the trail there into the woods (after seeing the two obligatory canons at the head of the trail). In total, we walked in the winding woods, up and down hills, for roughly an hour. There was little about the walk that made me feel battlefield, or even anything historic, but it was a great walking trail and good exercise. The company was good (again), but less chatting, because the trail is very narrow, so we walked single file. At the end, rather than walk back through the woods, we walked back along the road itself (where people were jogging and biking as well). We chatted a lot more then. When we got back to the cars, our total walk time was just under two hours. It was a very nice workout. We decided to throw away the entire benefit of the exercise, and grabbed dinner at Five Guys (hamburgers and fries). Before Tuesday’s walk, we had planned on getting together Saturday morning for a walk as well. This time there were five of us. We lost one of the original gang of four (he was supposed to be out camping over the weekend, but his plans changed a number of times). We picked up two additional walkers. We decided to redo the second part of Thursday’s walk on Lee Drive. This time we returned through the same woods rather than taking the road, so the total trip (since we skipped the first Lee Hill part) was 90 minutes round trip. We walked single file, very little chatting, and maintained a reasonably good pace throughout. Since the end was mostly uphill, we finished on an exercise high. After lunch four of us went to see the new movie WALL-E. It has superb animation and the story is cute, but to me, there was nothing special about the movie. I chuckled a bunch and there were zero unpleasant moments, so it was a relaxing way to spend a few hours. That said, the young kids in the audience squealed with delight, so that’s the only age group that I can highly recommend the movie to. Anyway, all in all, great exercise, great company, a touch of history (if a little underwhelming), a mindless (but cute) movie, followed by collapse in the hotel room. Thanks guy, and thanks to Lois for making it all happen! P.S. When we travel, I have various tray tables with me for different situations. 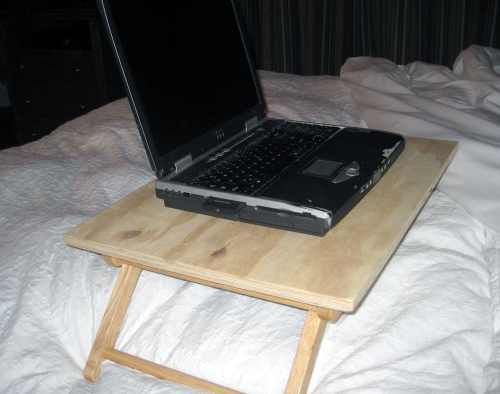 In the hotel, I use a tray table meant to serve breakfast in bed, but I put a laptop table (from Bed Bath & Beyond) on top, since my laptop is way too heavy for the thin part that the plates are supposed to sit on. For a number of reasons, I forgot (first time!) to bring the tray table and laptop table. Luckily, I had an identical tray table at the apartment (where we left from this time), but no laptop table to put on top. I decided that I would either buy a new one ($10) or perhaps just get a single piece of plexiglass or wood at Home Depot. I mentioned that to Rob Page (CEO of Zope Corporation) and he told me that he could cut me a piece of wood to do the trick. We saw this group at BB King in NYC nearly 18 months ago. I briefly mentioned the show, including that they were awesome, in my uber rediscovering live music post. We’ve been to Wolftrap twice before, but both shows were at The Barns. Last night’s show was in the Filene Center, which is the main pavilion for concerts. It’s an outdoor venue, with a cavernous covered area with proper seating, and a large two-tiered lawn system that is completely outoors behind the main structure. We bought our tickets months ago and even back then were forced to select seats way to the right of the stage. They were in the fourth row, so that part was great, but we were three and four seats off of the extreme right aisle. I’ll cover the opening act later (a group we’ve seen before and like as well). Ricky, Bruce and Ricky’s band, called Kentucky Thunder came on stage at exactly 9pm. The crowd wasn’t just there for an evening out, as it was clear that they were giant fans of either Ricky, Bruce, or both (as we are). Last year they released a CD called Ricky Skagss & Bruce Hornsby (catchy title). In March of this year, they released another, named Honoring the Fathers of Bluegrass: Tribute to 1946 & 1947. They played a bunch of songs from both CDs. They also played a few more of Bruce’s big hits, done reasonably differently than the original Bruce Hornsby and The Range versions. For the most part, the Bluegrass versions (of Bruce’s songs) work great (even though I still prefer the originals). In the case of Mandolin Rain (which is on last year’s CD), it’s not even 20% as good as the original (IMHO). It’s cool, and if I didn’t know the original, I would like it more, but I feel teased when I hear this version. A better example is their rendition of The Way It Is (title cut from Bruce’s album of same name). It’s a really great Bluegrass version (though I still like the original a little more). I’ve already said that both Bruce (on piano) and Ricky (mostly mandolin, but also amazing on guitar on three numbers) are incredible. Let’s cover the rest of the band, left-to-right on the stage. The only guy to the left of the grand piano, and reasonably far behind it in the back of the stage, is Andy Leftwich on fiddle. He’s truly amazing. We’ve seen some great fiddlers in the past year, so I’m not sure I can say that Andy is the best of the best, but I’m equally unsure of any flaws that he has that would keep him out of that group, so suffice it to say he’s a joy to listen to! Andy was obscured from our view the entire night, so unfortunately, no photos of him. Behind the piano, just to the right of it, dead-center stage, is Mark Fain on upright bass. Excellent all night, but only highlighted in one number, late in the evening. Solid, never a distraction. Toward the right side of the stage were three acoustic guitarists in a row (slightlly unusual). The first of them is Cody Kilby. Of the three, he plays primarily lead guitar. Run, don’t walk, to his MySpace page and listen to the four songs on there. His fingers move so fast and his leads are extremely interesting. I had to stare at his fingers to really beleive that one man could make the sounds that came out of his guitar. It sounded like two great lead guitarists playing at the same time. Nope, it was all Cody. Wow! I’m definitely getting his new CD! Next was Ben Helson. Bruce introduced Ben as being new to the band. Unfortunately, the Wikipedia page I linked to above shows him as a former band member, and still shows Darrin Vincent on the main page. In any case, it’s definitely Ben in the middle of the guitar trio. He plays excellent rhythm guitar and sings backup vocals on a very few numbers. Solid, but not highlighted at all. Next was Paul Brewster. Also played rhythm guitar, but featured on background vocals on nearly every song. He has an excellent voice, complementing Bruce, Ricky and both together whenever he joined in. Finally, Jim Mills on banjo. He has won quite a number of Banjo Player of the Year awards (the site says four, but I recall Ricky say six or seven when we saw them at BB King last year). He definitely deserves it. His banjo playing is so crisp, clean, fast, interesting, driving. We’ve seen some truly great banjo players in the past year as well (like with the fiddle and mandolin players), and for my taste, Jim is probably in third, very (very) close to number two. 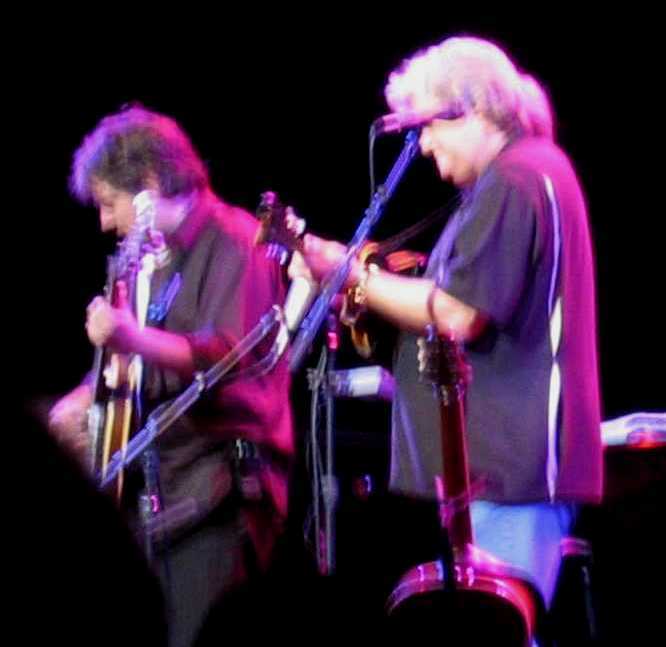 My top pick is Bela Fleck (more on him in a minute). Second is Ron Stewart (currently part of the Dan Tyminski Band). 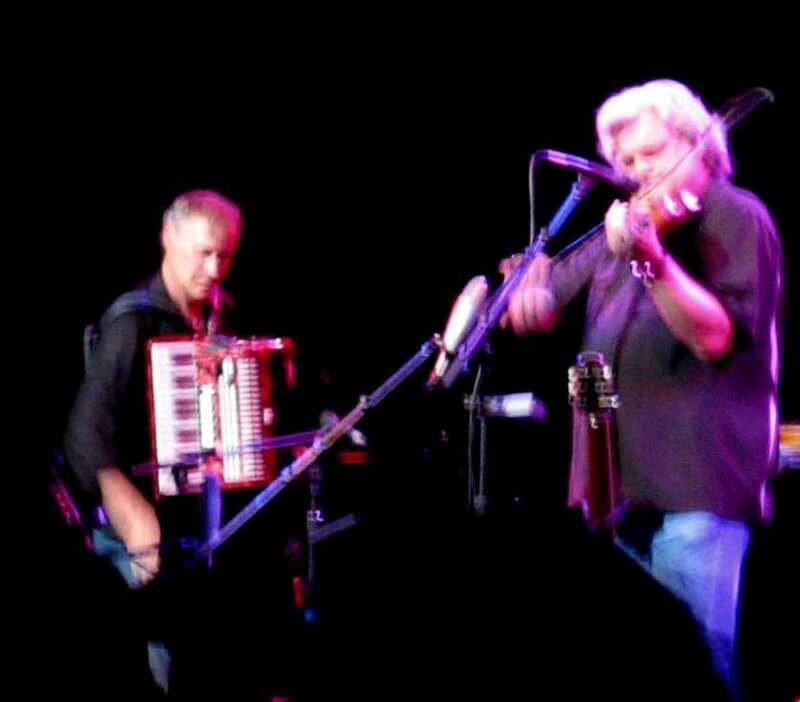 Here is a YouTube video of Ricky Skaggs and Kentucky Thunder. 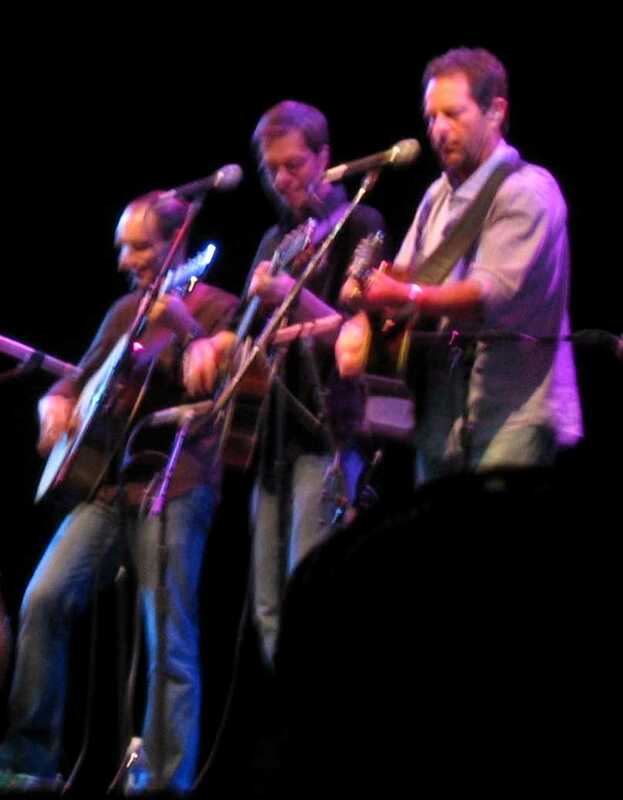 There are a few nice highlights of Andy playing fiddle, Ricky on the mandolin and Cody on guitar. In the middle of the set, they asked anyone in the crowd who wanted to come up and do some clog dancing to join. No one volunteered, and you had to wonder whether people thought they were just joking around. After some more teasing a few people climbed the stage, which started a flood. There were roughly 30 people on stage with them, dancing around in a frenzy. It was cool. It also highlighted a truly idiotic policy on the part of Wolftrap. There are a few signs around (not all that prominent, but also not invisible) that there is no photography permitted (even without a flash). That’s just silly in this day and age. Of course, not only were tons of people taking photos throughout the show, many were doing it with flash on as well. Ushers were flying all over the place admonishing people, even as others a few rows away kept snapping. The reason I say that the clogging highlighted it is that even with 30 people on the stage dancing around, clearly to the delight of the crowd, ushers were trying to stop people from taking pictures (of their loved ones, etc.). Truly silly, but what can you do… Lois got off some shots (and got yelled at once) but she took five percent of the number of shots she would have if it was permitted. She never uses a flash during a performance, even if it’s allowed. I will come back to one cool part later (you’ll understand why I’ll tell that part out of order when I get to it). They played an amazing 97 minutes before saying goodnight. After a rousing standing ovation, Ricky, Bruce and Jim Mills came out on the stage alone. For this one number, Ricky played the fiddle (really well!) and Bruce played the accordion (to the delight of the crowd!). Then the rest of the band came out and rocked the house with another full-energy number which ended with another standing ovation. Total time on stage 112 minutes of pure joy! The opening act was Abigail Washburn and the Sparrow Quartet. They too have a new CD out called Abigail Washburn & the Sparrow Quartet. We saw them at Joe’s Pub in January this year, described briefly (by my normal standard) 😉 in this post. 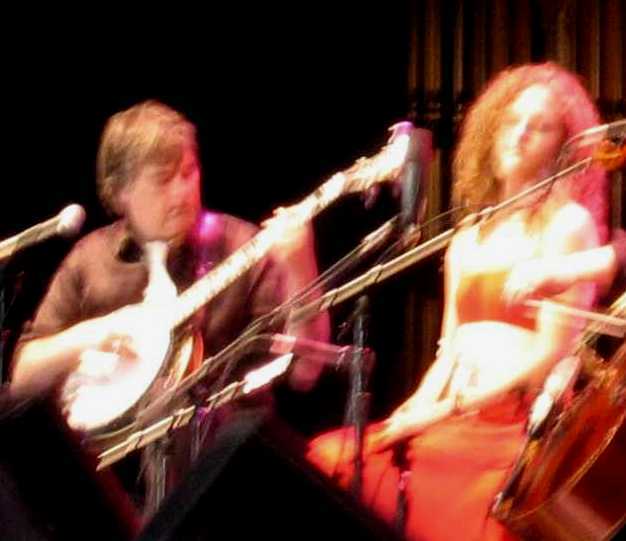 I mentioned above that Bela Fleck is my favorite banjo player. He plays every conceivable style (bluegrass, classical, jazz, country, dirges, etc. ), all fantastically. Abigail Washburn has a great voice, and plays the banjo extremely well too. Casey Driessen is an incredible fiddle player and Ben Sollee is a superb cello player who also sings gorgeous harmony with Abigail. They came on stage at 7:58pm (two minutes early, a rarity indeed). They were introduced, and started playing at 7:59pm. They left the stage at 7:47, so they gave a very nice warm-up show, with very little down time between acts. I was very impressed by Wolftrap in that regard! The surprise I alluded to above is that well into the Ricky and Bruce show, they invited Bela to play with them. He’s recorded with Bruce a couple of times (and probably Ricky as well). He was on stage with them for 25 minutes (very nice indeed) and on one number, played a cool banjo duet with Jim Mills. Tons of fun. Bela is just a superstar in my opinion. Wolftrap can hold 7,028 people in total (at Filene), with 3,868 under the structure and 3,160 on the lawn. During the Sparrow Quartet set, there were hundreds of seats empty including the six to Lois’ immediate left. There were entire sections left and right of the stage, at the back of the seating area, without a single person in them. We were shocked, given that I didn’t have that much choice when I purchased tickets months ago. I assumed that when Ricky and Bruce came on, it would be full. It wasn’t. Barely a few dozen of the empty seats were filled in the intervening 13 minutes between performances, so we slid down five seats and got a better angle for the main event. By the time the show was over, the seats were practically full (an empty seat here or there, like the one Lois left empty between her and the person she slid down next to). I don’t know if people just showed up late, or if they allowed people from the lawn to come down. The lawn still seemed pretty crowded so it could have just been late folk. Anyway, a fantastic show all around that we thoroughly enjoyed. Lois and I had a slightly unusual, but completely lovely weekend. On Friday, our goddaughter and fiance drove a Budget rental truck up from Richmond, VA with a bunch of their stuff. They are moving to NYC after their honeymoon (putting them in NYC in three weeks!). We helped them move their stuff in and then had dinner with them on Friday night. On Saturday, they worked (like crazy people) for roughly 13 hours in their new apartment. We had a very late lunch, or very early dinner (you pick) when they were ready for a break. On Sunday morning, we all left for VA very early. For us, it was part of our normal trip down to Zope (except that this trip will end with their wedding, hardly normal). For them, they rented the Budget truck one-way only, so we were giving them a lift back to VA.
All well and good, except that we had previously arranged to visit our friends in Leesburg, VA on the way down (I’ve written about them a number of times), including taking a bunch of boys to see Kung Fu Panda. Our NYC guests agreed to join us for the festivities. We got to Leesburg right on time (in fact, we beat our friends to the restaurant). We had our typically great Chinese Buffet (11 of us). Then we gave the parents a break and took five boys (ages 7-10) to see the movie. For a movie that’s been in theaters for two weeks, I was quite surprised that it was as crowded as it was. The seven of us (Lois, me and the boys) sat in the third row (usually, that’s too close up for Lois, but it wasn’t all that bad this time around, perhaps because it’s an animated movie). I don’t know where our goddaughter and fiance sat. After the movie we drove to Fredericksburg and met out friends (our goddaughter’s parents) at our hotel. We all had a lovely dinner together, and they took posession of the soon-to-be newlyweds and drove them back to Richmond. We did our usual Walmart run to stock up for our trip. When we returned to the room, Lois did an incredible job of unpacking and organizing while I relaxed and watched some TV. That lasted an hour, and then a wild storm in Fredericksburg knocked out all of the electricity to the hotel (at roughly 8:43pm). The generator got the lights back on for about 30 seconds before it failed completely. There we were, in the dark, watching a cool lightning storm outside the window. After about 25 minutes, with nothing else to do, we went to bed (we were wildly exhausted anyway), at 9:06pm. We have no idea when the electricity came on, but we were both awake (briefly) at 1:30am, when it was indeed back on. Thankfully, Lois ran around and turned off all of the lightswitches before we went to bed, so that we weren’t woken up. By now, if you haven’t seen the new ads being put out by MoveOn.org, or seen previews of them on a cable news channel, you’re either very lucky, or blissfully disconnected from the political season. Rather than describe the ad, I’ll point you instead to an Op-Ed in The New York Times, written by one of their two token conservatives, William Kristol. I can’t do any better than Kristol in analysing the content/message of the ad, so I won’t try. Here are a few additional thoughts though. It would seem that the ads must be targeting group #3, as there is no way that #2 can be swayed by them (in fact, this kind of ad would mobilize group #2), and group #1 already believes in the cause as strongly as they can, so it’s a waste of money and a lost opportunity to show these ads to them. So, in a group that thinks the answer isn’t simple, can this ad be effective? I find it extremely hard to believe. It literally requires the viewer to suspend all logic, and react purely to the emotional message only. If you disagree, meaning that you think that the message delivered has even a single basis in fact, then you didn’t read the linked Op-Ed piece very carefully. I also see this type of ad as working against Obama, who is the person they most want to see benefit from it. It is highly doubtful that he will denounce it. After all, he’s one of the few prominent democratic senators who didn’t vote to denounce the General Petraeus ad. It would seem that annoying MoveOn.org is not high on Obama’s agenda. However, by not denouncing it, he risks seeing moderate people who are offended by the ad as seeing him as pandering to MoveOn.org (or worse, actually agreeing with the ads). In fact, it completely amuses me that Obama’s stated reason for changing his widely disseminated stance on Public/Private money is the 527 money on the Right side (a.k.a. the Swiftboating money). Not once does he mention the vasts sums of money that are meant to benefit him from the likes of MoveOn.org. For me, I have no problem with either side throwing their money away on these types of ads. They are truly stupid (the ads), and hope and assume that the viewers are stupid as well. Anyone who requires that their audience is stupid in order to be successful will (thankfully!) be negatively surprised more often than they would imagine. That makes them the stupid ones in the equation. I rarely write a post simply to point to someone else’s post, brilliant or otherwise. I used to be a voracious reader. That was so long ago, I’m embarrassed to even make that claim. There are many reasons why I don’t read as much (not the least of which is that I’m the world’s slowest reader). Mostly, it’s because I spend so (too?) much time on the Internet, that I don’t just disconnect and read. Anyway, I admit that the concept of the Kindle intrigued me to the point of considering one. If I got one, I was hoping that a side-effect would be to read more, just because I couldn’t buy one and not use it, right? Well, I still haven’t bought one, and I’m not that close to doing it, but I still read everything I can about the Kindle, to be ready when the tipping point comes my way. So, today I finally read a post about the Kindle that is inspirational (IMHO). It’s written by a guy, Seth Godin, who often writes intelligent, thought provoking pieces. Here it is, enjoy! So, I downloaded and built 0.7.2. Then I followed the instructions at the bottom of this page, which explain how to upgrade on the fly. It’s even cooler than just not losing any ongoing connections (which would be cool enough!). It also can be rolled back just as easily, if the new server proves to be faulty. This is just too cool! Anyway, welcome NginX 0.7.2, RIP NginX 0.7.1. All of my good posts were made with Windows Live Writer locally on my laptop and then saved to the server as a draft for continued editing. All of my bad posts were started and finished directly in the web interface of WordPress 2.5.1. This certainly wasn’t a native 2.5.1 problem, because I’ve been running 2.5.1 a lot longer than my first bad RSS pull and until reasonably recently, I posted 100% of the time through the web interface. I selected the last few rows from the wp_posts table and spotted the problem instantly. There was a pointer to a patch in that thread. The person who posted the link also commented that he thought this was not the “right” fix, though he said it worked. I’m not sure why he felt that way. Aside from being innocuous (meaning, there was no way that this could hurt anything), it seemed like a reasonable fix and was already in the trunk for WordPress 2.5.2, so it also seemed safe to apply, given that it would soon be production WordPress anyway. Yesterday, I took a (cheap) shot at the Firefox launch fiasco. I didn’t need to do it, but I don’t really regret it either. You can’t have it both ways. You can’t want to hype the hell out of the launch, and then be unprepared for it. Anyway, even though the official launch was delayed by 76 minutes, the US suffered an outage that lasted at least 30 minutes longer. It doesn’t matter. They are blowing the numbers off the screen and there are still more than four hours left to download Firefox. As I predicted yesterday, I accounted for four legitimate downloads, two yesterday (for Lois and me) and two today for the ancient guest machines. It took me a while to be sure that Firefox 3 was faster than Firefox 2, but I’m convinced it is now. There is one site that I visit typically once a day, that takes a very long time to paint/load. It loads substantially faster in Firefox 3. That’s not why I titled this Firefox 3.0 is Awesome. If you know Lois, then you know that she’s effectively legally blind. We run her laptop at a bizarre resolution, and then still have to pump the DPI (dots per inch) up, so that everything is hideously large on her screen. I can’t even begin to tell you what that does to any reasonably complex web page. Aside from the fact that very little of the page typically fits on Lois’ 17″ monitor, most complex web layouts overlap the text, including hyperlinks (for her), making it near impossible to click on some links (you simply can’t get the mouse over the link! ), and many of the pages are nearly unreadable as well. This has been true (for years!) on both Firefox (all versions) and IE (all versions). We dropped the Font size to 18 and reloaded. It got a drop better, but not much. Another look at the preference panel and we realized that we needed to go into the Advanced settings. In there, we saw that Lois had a minimum set of 24. We changed that down to 18 as well, and the page now showed off perfectly for her. Then we went to our bank site, where Lois always has trouble hitting certain links. It painted perfectly (albeit with scroll bars). We played with Ctrl-Minus (Ctrl -) and the page shrunk perfectly. Previously, that key combination might have shrunk the text, but the rest of the layout often got worse. Now, Ctrl-Minus and Ctrl-Plus (Ctrl +) work flawlessly. Yippee! Finally, I didn’t care about most of the addons that weren’t Firefox 3.0 ready. One I really cared about, TinyURL Creator and one I like (but could live without) Linkification. Rather than disabling version checking (dangerous at best), I decided to hand-tweak these two since neither is sophisticated, and therefore unlikely to fail or cause harm. In both cases, I found which directory they were installed in under the extensions directory in my Firefox Profile (this is on Windows). I then edited the install.rdf file, and found the max version number that they would run in, changing it from 2 to 3, and voila (after restarting Firefox), both work beautifully again. Well, it’s finally here. I was all set to do my part with helping them attain the nonsensical world record download numbers. Both Lois and I use Firefox as our primary browsers, and I have an ancient laptop that I occasionally use in a hotel room that I was going to upgrade, and one other one that I sometimes use as a guest machine. So, I was about to legitimately download it four times (I hate all manners of ballot stuffing, so I wouldn’t download multiple times just to up the count!). Lo and behold, 10am PDT came, and the Mozilla site is 100% unresponsive. Way to plan for a world record! Fully 15 minutes later, when you would think they would have been aware of the problem and would have switched to Plan B (they did have a Plan B, no?!? ), the site is still pathetically slow (at least it finally loads! ), but amazingly, it still only offers the link to Firefox 2.0.0.14!